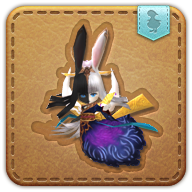 Summon your wind-up Tsukuyomi minion. Barren waters, heed unto the tide. Conscripted into the imperial army, only to be handed over to Eorzean Alliance officials in an unreported prisoner exchange, one humble goldsmith celebrated his regained freedom how most goldsmiths do─he crafted a lifelike replica of the Lady of the Moon, Tsukuyomi.